Why Hand Sanitizer is a “Must-Have” on a backpacking trip!! Let’s face it; hand sanitizer is THE basic way of maintaining personal hygiene while you are out in the wilderness. Of course you can wash your hands thoroughly with soap and water, but what if you run out of soap, and more importantly, what if there is no viable water source nearby!? Thousands of bacteria going down your food pipe…. So this is where the hand sanitizer comes into the picture. Any type of hand sanitizer has ethanol as its primary ingredient. And this particular ingredient has the capacity of killing almost 99.99% of bacteria. The presence of isopropyl alcohol is also an important factor. A simple squirt of sanitizer is capable of doing what gallons of soap would fail to deliver! So, bury this in mind that you will have to use hand sanitizers before every meal…that is, if you don’t want to cut the trip short because of unwanted infection or gastrointestinal illness! Did you know? Hand sanitizers can also be used to start a fire in case of an emergency…it is indeed quite versatile, right? 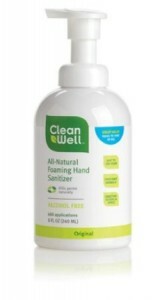 Alcohol-based sanitizers: They are cheap and easy to find. However, these are capable of dehydrating your skin. Alternative to alcohol-based sanitizers: It means you either use soap-and-water, or you can try a benzalkonium (BAK) chloride-based hand sanitizer. Even if the soap-and-water routine proves a bit difficult in some cases, it serves its purpose. And something is better than nothing! Inclusive of ingredients like Active – Thymus Vulgaris Oil (Thyme Oil); Citric Acid; Sodium Decylglucosides Hydroxypropyl Sulfonate; Citrus Aurantium Dulcis; Copper PCA; Inactive – Aloe Barbadensis Leaf; Sodium Coco-Sulfate Hydrolized Oats; Origanum Vulgare (Oregano) Oil; Litsea Cubeba (Litsea) Oil; Sodium Citrate and Water. Ideal for individuals with sensitive skin. Simple to use—just take a dollop of foam in your hands and rub your palms till it dries. With features so amazing, it is no wonder that this product has bagged a high rating of 4 stars out of 5 at Amazon. The moment your skin reacts to a hand sanitizer, it is best to stop using it immediately! All said and done, don’t forget to take your hand sanitizers with you on your backpacking trip. You will save yourself a lot of trouble…happy hiking!